The relationship between linguistics and translation theory, whose problematic character was shown by G. Mounin in the days of structuralism, remains to this day a major epistemological issue. Whether this relationship is viewed as an association of disciplines in which one contributes its conceptual tools or its justification to the other (see M. Ballard & A. El Kaladi) or as a process leading from one to the other (see T. Milliaressi, ed. ), there is still room for debate on most aspects. Indeed, the evolution of research under the growing influence of technical tools for the study of linguistic phenomena makes this debate all the more crucial today. Whatever the basis of their theoretical approach (corpus linguistics, literature, philosophy, stylistics, etc. ), the translation specialist can hardly ignore linguistics and its contributions, which are (all too) often regarded as restrictive in the broad intercultural field of translation. These are, then, the theoretical and epistemological implications of a sometimes conflicting, sometimes felicitous relationship that this conference proposes to probe and to renew. – articulating the theorizing activity in translation studies and translation as a praxis. This is a non-exhaustive list of avenues that may be explored primarily within the scope of a comparison between English and French. Comparisons between English and other languages are also welcome. Ballard, Michel & El Kaladi, Ahmed (eds), Traductologie, linguistique et traduction, Arras, APU, 2000. Milliaressi, Tatiana (ed. 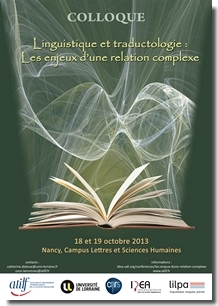 ), De la linguistique à la traductologie, Lille, Presses Universitaires du Septentrion, 2011. Ladmiral, Jean-René, « Sur le discours méta-traductif de la traductologie », in Meta 55, n°1, mars 2010, 4-14, p.6. De Vogüé, Sarah, 2005, « Invariance culiolienne » in Ducard, D. et C. Normand, Antoine Culioli, un homme dans le langage, Paris, Ophrys, 2006, 302-331, p.308.